When is the last time you did something for the first time? A while ago? Then join us on a foodie adventure, because this month we’re all about stretching those culinary boundaries and exploring ingredients that don’t necessarily make it into our everyday supermarket baskets. Witlof is one such ingredient. 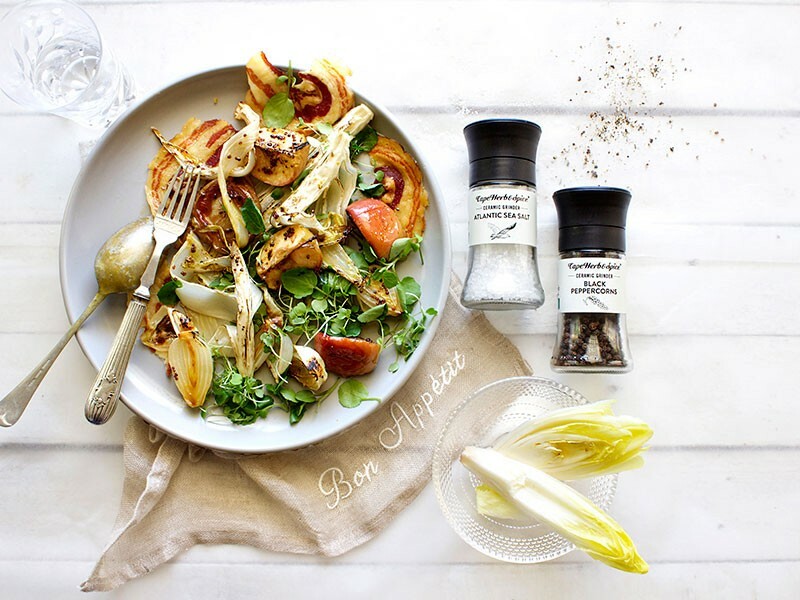 Also known as chicory or Belgian endive, witlof has a very subtle bitter edge to it that pairs marvelously with a whole host of things, from salty soft chevin and walnuts, to pears and blue cheese, to Emmentaler and ham. It can be eaten raw or cooked. We decided to roast it along with tiny crunchy red apples and shallots. A splash of olive oil, red wine vinegar, wholegrain mustard, honey and plenty of salt and pepper gives it a sweet-salty-sour tang that is so satisfying. Pancetta crisps lend a deep umami basenote, and peppery freshness comes in the form of watercress. Now that’s what we call a salad! Place the pancetta on the second tray and bake it at the same time for 15 minutes. Remove and allow it to cool. The pancetta will crisp right up as it cools. To serve, tumble loads of watercress onto a large platter, spoon over the warm veggies, delicately place the pancetta shards and top with micro rocket. Serve right away.